What an inspirational vision in light blue tones! Cloud Ballet's classically formed flowers boast heavy ruffles and lace. 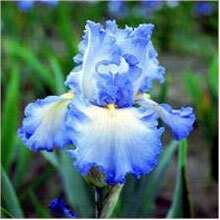 See how the azure petals lighten at their centers, complementing the yellow-tipped white beards. Good growth, sweet fragrance and occasional rebloom distinguish this Northwest origination as a winner.